Plumas residents shared their concerns with us about several provisions in our draft they thought were too restrictive. They spoke. We listened. Plants are not visible from any street. When growing up to three plants, plants are set back from the premises’ property lines a minimum 25 feet from sides and rear property lines and 35 feet from front property lines. When growing four to six plants, plants are set back from the premises’ property lines a minimum 50 feet from sides and rear property lines and 70 feet from front property lines. From sunset to sunrise, grow light systems are shielded, including adequate coverings on windows, to confine light and glare to the interior of the structure. All exterior doors are lockable. Structure is permitted for residential use or accessory structure to residential use. Each structure is set back at least 10 feet from the side and rear premises’ property lines and 25 feet from the front premises’ property lines. 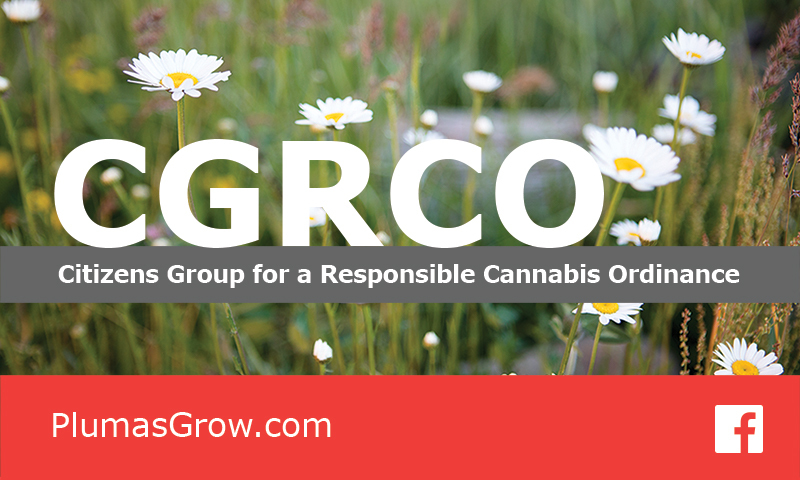 By showing hardship or good cause, residents can apply for special use permits to waive some of the restrictions involving indoor and outdoor growing. And as a reminder, our earlier revised cannabis ordinance draft allows delivery of medical marijuana. If patients can’t grow their own plants or don’t want to, they can have it delivered to them. We revised our position because we fully embrace recreational and medical marijuana rights and want patients to have convenient access to their medicine. Read our revised ordinance summary and full draft here.